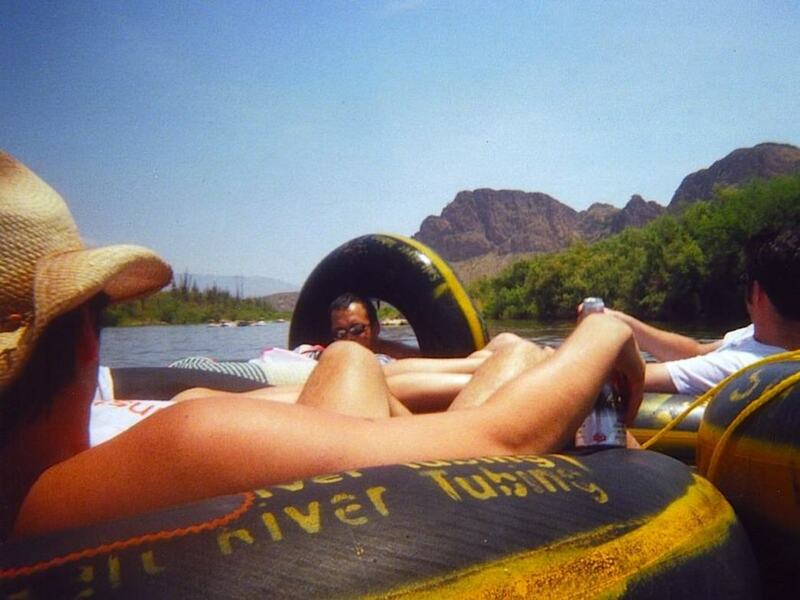 There's lots of whitewater rafting in Northern Arizona, but for a relaxing day on the river, northerners head south to Phoenix and the Salt River. A stress-free tubing experience is easy with a little bit of forethought, planning, and a little bit of insider knowledge. 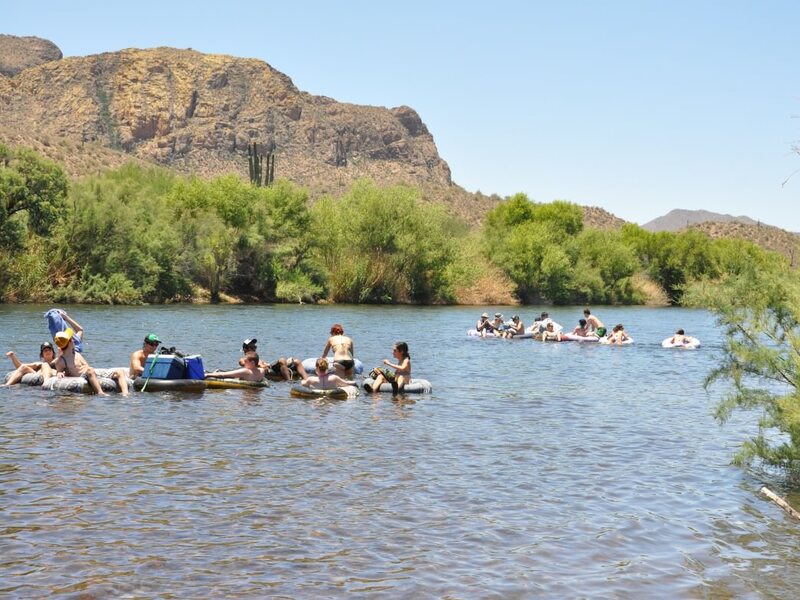 Escape the monsoon and enjoy a day of floating down the largest river in the Phoenix area. Sunglasses, a hat and lots of sunscreen. Consider an umbrella or parasol. Swimsuits are de rigueur, but consider bringing more clothing to protect from the hot sun. Temperatures easily pass 100 degrees in the summer, which can be devastating for those not used to it. Water shoes: Flip-flops may be lost, and the sand is too hot for bare feet. Water: at least a gallon or two per person, plus at least one bottle of water for every beer. Stay hydrated. Rope: Tie the cooler to a tube for easy transport, and tie inner tubes together as desired. Inner tubes, pool toys, kayaks, etc. Make sure everyone has an inner tube or other flotation device, plus at least one extra for the cooler and trash bag. 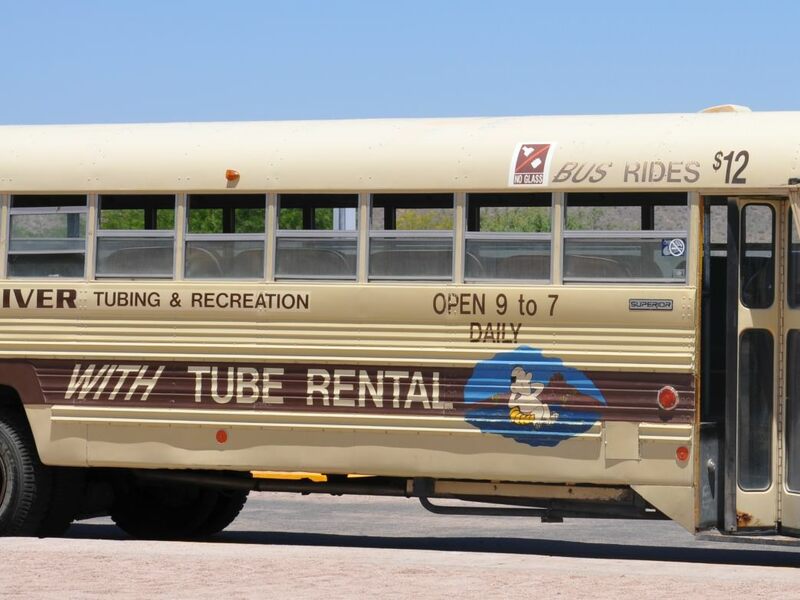 It's possible to rent tubes from the Salt River Tubing company. 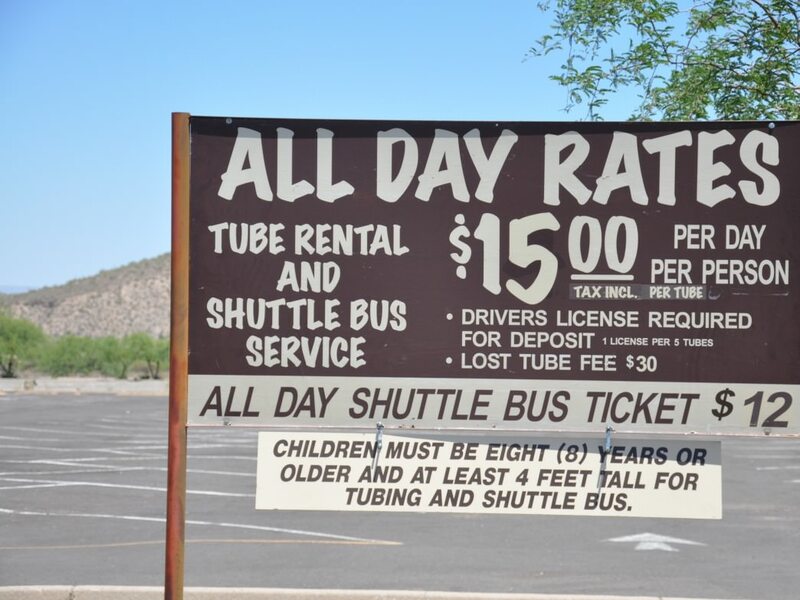 With a cash-only tube rental, they provide bus service from the parking lot to and from the top and the bottom of the river. But huge crowds cause long waits for both tube rentals and bus rides (thousands of people flock to the river on especially hot summer days), the tubes are the same price to rent as to buy elsewhere, and the buses are cramped and hot. To top it all off, some days the company will only allow renters to start from the halfway point. They do offer a discount in exchange for trash pickup, but that's only helpful for return trips. For a once-in-a-lifetime tubing trip, it might be worth the price and wait times to not have to plan. For everyone else, bringing tubes is a much better bet. Any kind of floating device will do, from kayaks to pool toys, but the standard sturdy rubber inner tubes are cheap at most gas stations along the way. Old sheets come in handy here – the black rubber quickly heats up in the sun! Inflate the tubes with air pumps at a gas station and tie them to the cars for transport, or bring a power converter to inflate them in the parking lot. There is one free parking lot close to the bottom, and a paid parking lot at the top, halfway point, and bottom. Parking passes are $6. Buy two. (They are much cheaper than the bus). Get them at most gas stations – the Walgreens on North Power Road is the last chance before the river. At the river, drop everyone except two drivers up at the top parking lot. Take both cars to the bottom parking lot, park one there, and bring the other car back to the top. (Or the halfway point, if a shorter trip is desired). At the end of the trip, retrieve the car parked at the top. This method of parking is a little extra work, but it saves money every day, and time most days. Remember to leave valuables in the cars or at home. If possible, only take one car key on the river and store it in a baggie in the cooler. Small valuables are very easy to lose in the river. Be careful when launching; the current is surprisingly strong. Tie everything together if desired, or leave tubes loose for riders to paddle at will around the river. Enjoy long stretches of tranquil water, punctuated by brief, fast-moving sections. Remember to pull up your legs when approaching rapids – sometimes the water is less than a foot deep! The trip will take anywhere from three to six hours, depending on the speed of the river, starting point, and any stops along the way. Two popular spots to pull off and eat include just under the bridge where the highway crosses the river, and a small cliff-jumping spot a little further down. Be prepared for crowds, especially on holidays and weekends. There will be yelling back and forth, speakers and sound systems galore, and the occasional giant marshmallow lobbed between groups. Everyone is very friendly, but the Salt River is not the place to go for solitude or quiet. There are several places to get out of the river. The last and most popular, for the bottom parking lot, is number 4. Don't miss the landing – it's a long walk back. The parking lot (and toilets) are up a short hill from the landing area. Take a few minutes and deflate the tubes before going up; it's much cooler and more pleasant near the river. Just make sure not to block the exit point. Deflating the tubes generally takes a while; use this time and send people to retrieve the car from the top parking lot. Even a relaxing tubing trip is draining; get food before driving too far. In 'N Out is a popular choice for Flagstaffians, mostly because there isn't an In 'N Out in Flagstaff. For a more substantial meal, try Red White and Brew for beer and reasonably priced, hearty American food. It has the added benefit of being very close to the river. Tubing shouldn't be a hassle; avoid stress, heatstroke and long waits with just a little bit of planning and a little extra up-front work.